The last Friday in the month is here and now is the opportunity to update you all on progress in the Seedy Packet Patch, but I have also been doing a lot of other stuff with seeds this month that I thought that I would share. This month has been busy for me. I’ve planted some of the amaranths and some radishes that I got as part of my first Seedy Packet. Unfortunately, I only managed to get these in this week, and there has been very little sign of sprouting so far. I will spare you a picture of bare earth, but there will be green and lovely photos next time, I promise. News of Seedy Penpals has been spreading. I think I have probably mentioned this a lot, but I am really enjoying seeing the wider effects swapping seeds online can have. I have seen new friendships form, and other links being made. Loads of people have said very kind things about the scheme. Thanks for being wonderful penpals, for the duration of the first swap, and beyond. I hope that the community will continue to grow and support each other. Thanks to Michelle at Veg plotting, I reached out to a gardener, who also runs a postal seed exchange; Patrick at Bifurcated Carrots. He was very generous with some tips on the practicalities of seed exchange in an international setting, and he wrote up a lovely post about Seedy Penpals. On top of that, he is practically a neighbour, so I hope to meet him very soon, and discuss all things seedy (not a euphemism, honestly)! Last week, I found out about Cityplot. I got in touch with them (there seems to be a general theme of Seedy Penpal stuff making me braver. I’ve been reaching out in more directions than a party of octopuses on a fairground ride), and funnily enough, Ann got back to me straight away to say that she had heard of me and Seedy Penpals through Bifurcated Carrots, and she’d intended to get in touch. I love the serendipity of things like this. I booked myself on the Cityplot Seed Saving course, run in conjunction with Urban Herbology, and from the conversation I had with Ann, things seem to have snowballed (in the very best way). 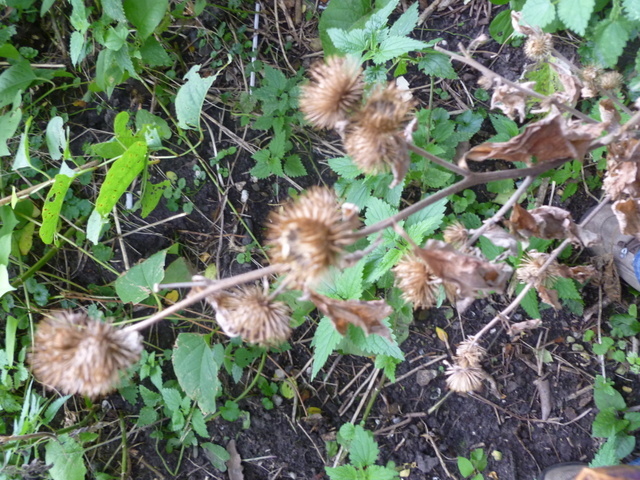 Last Friday, I found myself meeting up with Jennie and a bunch of other enthusiastic people, and heading off to a little patch of wilderness on a burdock seed forage in preparation for the workshop on Sunday. Harvesting seed from a very irritating plant, covered in bandanas and swimming goggles is a very quick way to unify a group of strangers, let me tell you. We all donned gloves to harvest the driest of the burrs from the plants in the patch, before having to wear more protection whilst we shook , stamped on and rubbed the burrs to encourage them to release their seedy treasures. Our unconventional attire seemed to get a lot of interest from passing dog walkers and cyclists. Some of them came and asked us why we were all covering our faces; they went off happy that we were doing no harm, and were just protecting ourselves from the prickles that cover the burrs. 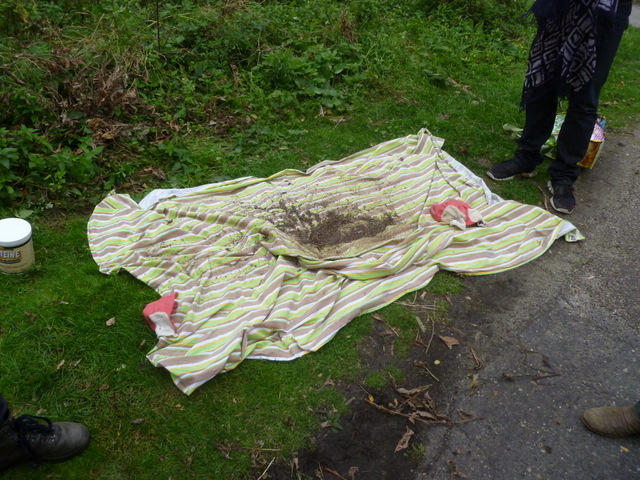 We did have to explain ourselves to some parks police, and the actual police did a slow drive by a couple of times. Nothing that a friendly explanation couldn’t quickly clear up, but left us amused. It was all worth it, and we had collected and winnowed enough seeds for the workshop, plus we all got extra to take home with us. It is edible, but quite bitter. I am experimenting with bread, and I am also sprouting some, so I hope that will appear on a salad post sometime soon. On Sunday I headed to the seed saving workshop, where there were a lot of new faces, most of whom were fairly recent gardeners, but with some more experienced people. We learned about seed harvesting for both domestic and wild seeds, discussed open pollinating, and the importance of seed saving and sharing. It was a good mix of theory and practical work, as we headed out to the kitchen garden of the restaurant, which is maintained by Cityplot, to look at different seed type and how to save them. There were plenty of envelopes and seeds to take for all. It was really fun, and was accessible to all abilities. I guess you are wondering what we did with all that burdock seed? Well, we made a tincture and have instructions of how to mix it, and filter it to make it usable Everyone who attended the workshop went away clutching their tinctures, which are powerful skin and liver cleansers and a warming tonic for people who feel the cold. This was entirely new to me. I love to forage for food. I am greedy. The herbal and health side of things is not really my speciality at all. It was great to meet with new people and acquire new knowledge. Cityplot hold a number of other workshops including vermiculture, and growing exotics. 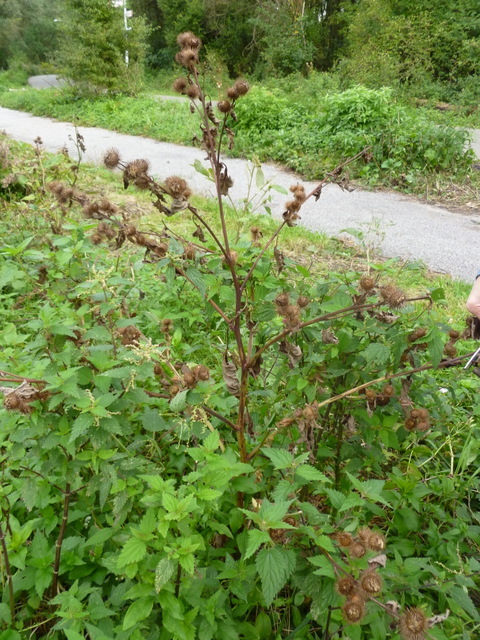 Urban Herbology run a number of similar workshops and foraging walks. If you are in Amsterdam, I really recommend them, you’ll have a lot of fun, and learn useful skills. Also through meeting Ann, I learned that a local arts group, Mediamatic, are having a “Sharing Exhibition” and were looking for examples of sharing. I went along to tell them about Seedy Penpals. One thing led to another here, and Cityplot, and I are looking at ways we can do a seed swap as part of this art project. So, Seedy Penpals could be going from virtual to physical for a couple of months in Amsterdam. 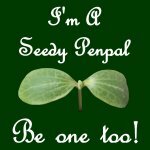 Don’t forget that you can join Seedy Penpals anytime, and that the next swap will be taking place in February. See here for more information, and to sign up. I’d also love to read about any progress your seeds have made, so let me know more. Disclosure: I was not paid to promote either City Plot or Urban Herbology, and neither was I asked to write about them. I paid for the course, and mention them here because it was something that I enjoyed, and is relevant to seed sharing. I think that others may enjoy their courses and get a lot from them too. However, I have met like-minded people, and we are looking at ways to collaborate in the future on foraging and cooking, as well as the art project. I hope that they will become friends too. Thanks Narf. At first I was enjoying the benefits that I could see Seedy Penpals were bringing others. It was a real surprise to realise that I have also been able to increase my networks and meet such great people too. And I must also include Carl in this, even though we run this lovely thing together, and not met in person, it has been a privilege to have met him virtually. I’m loving it all, and considering everything I sowed got destroyed in the recent gales, I’ll carry on. Luckily I saved some seed for spring, and I’ve acquired a new friend! Losing your seedlings is such a bummer Solly, I’m so sorry to hear that. However, I have loved watching your friendship with Lorraine blossom, it’s definitely been a highlight for me.